From the research of descendant Margaret Hookey, Melbourne, Australia. 1. Johann Kuse of Drusewitz was buried 8 July 1764. 2. David Jo(a)chim Kuse was born about 1732 dying 10 August 1802 aged 70 at Poggelow. On 24 April 1761 he married Catherine Elizabeth Drephal (died Poggelow 12 February 1803, aged 65). 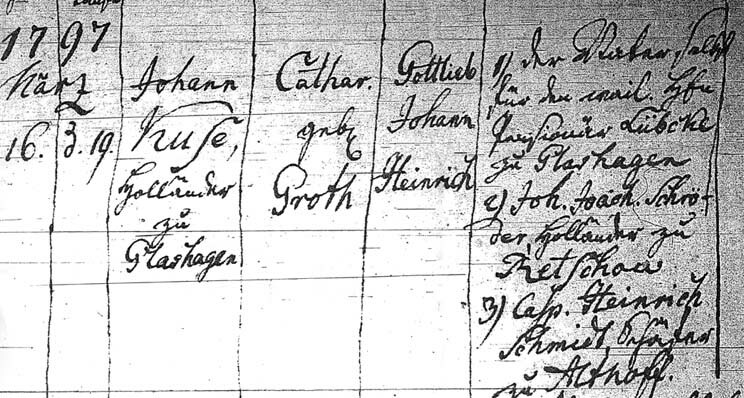 Known children were Sophia Maria born 5 January 1762/3, Maria Catherine born 16 September 1764, and Johann Joachim. 3. Johann Joachim Kuse was born in Brobberow 25 April 1766 (or 4 May 1767 according to another source) and was married 24 October 1794 at Toitenwinkel (Mecklenberg Schwerin) to Catharina Maria daughter of Heinrich Groth. Known children were Gottlieb (1797) and Johann Joachim (8 March 1799). Catharina Kuse died prior to Johann Joachim's remarriage in 1815 to Christina Seegert. Johann Joachim Kuse, shepherd in Glashagen, died before the marriage of his son Gottlieb in 1841.
and married Anna Sophia Schmidt from Jürgenshagen at Jürgenshagen on 19 February, 1841. He was listed as residing in Retschow and laboring in Schwaan. Along with their children Sophia, 7 and Johann, 6 they left from Hamburg on the Victoria 25 October 1856, arriving at Port Adelaide 7 February 1857. Gottlieb Kuse died shortly after his arrival, on 13 November 1857. Anna Sophia Kuse died at Natimuk, Victoria 4 January 1884 of "paralysis of the nerves." 5. Sophia Dorothea Lisette Kuse was born in Mecklenberg in 1849 and migtrated to Australia with her parents at the age of seven. She married Johann Carl Wilelm Bretag in 1868.